This handbook is the principal NRCS water quality reference regarding all agricultural land uses. The handbook is the definitive NRCS resource for water quality technical information, guidance, and procedures. Provides a simple procedure to evaluate the condition of a stream based on visual characteristics. It is designed for use by landowners and conservationists in the field. Water quality, precipitation, and project pool elevation data. Project reports and additional resources. Ask WATERS answers multi-program questions that draw on information from the databases linked through WATERS. This tool generates cross-program calculations, examines spatial relationships between programs, performs nationwide analyses, produces multi-program inventory reports for a given geographic area, and investigates interstate water quality issues. The 'Simple Query' answers frequently asked questions about WATERS data. Its easy-to-use interface returns summary, detailed, and graphical results in an easy-to-read format.The 'Expert Query' is a powerful tool consisting of fully interactive database views for users requiring more specific data analyses. The Assessment and Total Maximum Daily Load (TMDL) Tracking and Implementation System (ATTAINS) is an online system for accessing information about the conditions in the Nation’s surface waters. The Compliance Dashboard shows trends in environmental compliance and enforcement for both surface waters and drinking waters across the US. The dashboards provide an easy-to-use summary of activities to answer questions like: which facilities are regulated, how many have been inspected or otherwise evaluated, and how many have alleged violations and have been subject to enforcement. Environmental Quality Index and Associated Domain Indices by County for the U.S. This map service displays the results data from the EPA's Environmental Quality Index. The US Environmental Protection Agency's (EPA) National Health and Environmental Effects Research Laboratory (NHEERL) in the Environmental Public Health Division (EPHD) is currently engaged in research aimed at developing a measure that estimates overall environmental quality at the county level for the United States. This work is being conducted as an effort to learn more about how various environmental factors simultaneously contribute to health disparities in low-income and minority populations, and to better estimate the total environmental and social context to which humans are exposed. This dataset contains the finalized Environmental Quality Index (EQI), and an index for each of the associated domains (air, water, land, built environment, and sociodemographic environment). Indices are at the county level for all counties in the United States. How's My Waterway provides information about the conditions of local streams, lakes and other waters anywhere in the U.S. More recent or more detailed water information may exist that is not yet available through EPA databases or other sources. MyWater is a tool that makes use of EPA ATTAINS Data for in Tennessee and Kentucky, as well as elsewhere in the county. It includes information regarding water quality, monitoring activities, drinking water sources, watersheds, an urban waters widget that shows local activities, new and expiring permits, and stream flow. NHDPlus is a geo-spatial, hydrologic framework dataset built by the US EPA Office of Water, assisted by the US Geological Survey. Since its first release in 2006, NHDPlus has been made available to the wider water resources community and has been used for many diverse applications by Federal, state, and local governments, as well as non-profit organizations, private companies and educational institutions. The NHDPlus user community has developed tools and ancillary data to support their NHDPlus applications. The National Lakes Assessment (NLA) was the first-ever statistically-valid survey of the biological condition of lakes and reservoirs throughout the U.S. The U.S. Environmental Protection Agency (EPA) worked with states and tribes to conduct the assessment in 2007. The National Rivers and Streams Assessment (NRSA) is a collaborative survey that provides information on the ecological condition of the nation’s rivers and streams and the key stressors that affect them, both on a national and an ecoregional scale. This council offers an interactive map of monitoring activities around the county. The National Wetland Condition Assessment (NWCA) is a collaborative survey of our Nation's wetlands. The NWCA examines the chemical, physical and biological integrity of wetlands through a set of commonly used and widely accepted indicators. An EPA report that highlights select mining-influenced water treatment technologies used or piloted as part of remediation efforts at mine sites. STORET is an electronic data system for water quality monitoring data developed by EPA. STORET has taken various forms since the 1960's. Since about 2000, STORET has referred to a local data management system as well as data warehouse developed for purposes of assisting water quality data owners manage data locally and share data nationally. The EPA Center for Exposure Assessment Modeling (CEAM) distributes simulation models and database software designed to quantify movement and concentration of contaminants in lakes, streams, estuaries, and marine environments. This site provides access to watershed modeling tools such as Better Assessment Science Indicating Point and Nonpoint Sources (BASINS), Storm Water Management Model (SWMM) and Water Quality Analysis Simulation Program (WASP). This page has EPA resources and links to information about volunteer water quality monitoring. The data architecture of WATERS integrates information from various EPA water programs by linking it to the national surface water network. Using WATERS, environmental professionals and interested citizens can access comprehensive information about the quality of the nation's surface water. Available information includes but is not limited to designated use(s) of a waterbody; water quality monitoring results; assessments of water quality; causes and sources of impaired waters; and location of dischargers. The Aquatic Nuisance Species Task Force is an intergovernmental organization dedicated to preventing and controlling aquatic nuisance species. The Task Force's website is home to a variety of nuisance species resources related to impacts, species of concern, prevention, monitoring, control, education, and more. BAGS is a spreadsheet-based program that predicts bed load transport using six well-known bed load transport equations developed specifically for gravel-bed rivers. A companion document 'Sediment Transport Primer Estimating Bed-Material Transport in Gravel-bed Rivers' is also available. Every National Forest has a Land and Resource Management Plan. The Forest Plan describes desired conditions that may be achievable only over a period longer than the 15 years covered by the plan. Monitoring and evaluation reports for the Forest Plan are available here. Engineering projects along stream corridors require flow frequency estimates for their designs. Where sufficient streamgage data are available, the likely best method for developing flow frequency relationships are from statistical analyses of streamgage data. The standard procedure for developing these estimates use the logPearson frequency analysis. This spreadsheet tool was developed to implement this analysis procedure. The National Best Management Practices (BMP) Program was developed to improve management of water quality consistently with the Federal Clean Water Act and State water quality programs.The National BMP Program consists of four main components: 1) The National Core BMP Technical Guide 2) The National Core BMP Monitoring Technical Guide 3) Revised National Direction, and 4)A national data management and reporting system. The Forest Service's national riparian vegetation monitoring core protocol. Published in 2014. This webpage has information regarding some of the water and soil resource management efforts that have taken place in this national forest. The Kentucky Agriculture Science and Monitoring Committee (KASMC) is a partnership of national, state, and local agencies dedicated to coordinating agricultural science and monitoring efforts in Kentucky in order to promote sustainable farming and a healthy environment. These reports were published annually for many decades for use by engineers, scientists, managers, educators, and the general public. These static archival products supplemented direct access to current and historical water data provided by the National Water Information System web interface (NWISWeb), the authoritative source for USGS water data. The Cooperative Matching Funds Program is the Water Mission Area’s “bottom-up, on-the-ground” program that is designed to bring local, State, and Tribal water science needs and decision-making together with USGS national capabilities related to USGS nationally consistent methods and quality assurance; innovative monitoring technology, models, and analysis tools; and robust data management and delivery systems. The Program provides the foundation for USGS water monitoring networks (quantity and quality) and supports interpretative studies that cover a wide range of issues. From these web pages, you can create graphs and tables of streamflow and water-quality data from selected U.S. Geological Survey sites in the State of Tennessee. These U.S. Geological Survey webpages provide scientific data and information on the occurrence, fate, and transport of emerging and legacy contaminants in water resources, assessments of drinking-water sources, and the vulnerability of water supplies to contamination. This map (from USGS's National Drought Watch Web site) shows the 7-day average streamflow conditions in hydrologic units. Thus, the map shows conditions adjusted for this time of the year. The colors represent 7-day average streamflow percentiles for the day of the year. USGS sites having at least 30 years of record are used. The data used to produce this map are provisional and have not been reviewed or edited. They may be subject to significant change. USGS gages for monitoring current conditions of surface water, precipitation, groundwater, and water quality, as well as lake and reservoir elevations in Kentucky. Historical gage data for streamflow, groundwater, and water quality, as well as annual reports. USGS gages for monitoring current conditions of surface water, precipitation, groundwater, and water quality, as well as lake and reservoir elevations in Tennessee. This booklet describes how groundwater occurs and how its quality is assessed. Since 1889 the United States Geological Survey has collected continuous stage, discharge, and other instantaneous time-series data on the nations rivers and streams. These time-series data have been and are typically recorded at intervals ranging from 5 to 60 minutes. This web site has been established to make available as much historical instantaneous data from USGS data collection stations as possible. Although this site currently serves instantaneous discharge (streamflow) data only, work is planned to extend it to other time-series parameters in the future. The lab performs suspended-sediment concentrations and suspended-sediment sand-fine breaks analyses for project personnel from 23 USGS Districts. These analyses can be used to estimate silt transportation and deposition in streams, rivers, and reservoirs. SPARROW is a modeling tool for the regional interpretation of water-quality monitoring data. The model relates in-stream water-quality measurements to spatially referenced characteristics of watersheds, including contaminant sources and factors influencing terrestrial and aquatic transport. SPARROW empirically estimates the origin and fate of contaminants in river networks and quantifies uncertainties in model predictions. The NADP monitors wet atmospheric deposition at approximately 300 locations throughout the United States and two locations in the Cumberland River Basin (Land Between the Lakes and Mulberry Flat (Also in Land Between the Lakes)). A fundamental NADP program objective is to provide scientists, resource managers and policy-makers world-wide with a long-term, high-quality database of atmospheric deposition to support research and decision-making in the areas of air quality, water quality, agricultural effects, forest productivity, materials effects, ecosystem studies, watershed studies, and human health. The NWIS is the Nation's principal repository of water resources data. It includes data from more than 1.5 million sites, some in operation for more than 100 years. Data is available on streamflow, droughts, groundwater, and surface water quality and is searchable by state. NAWQA is a USGS database that can help you answer three questions: 1) What is the condition of our Nation's streams, rivers, and ground water? 2) How are these conditions changing over time? 3) How do natural features and human activities affect these conditions, and where are those effects most pronounced? Basic information from USGS about water quality. A study involving suspended-sediment and turbidity monitoring at streamgaging stations near the segment of State Route 840 under construction between Fairview and Bending Chestnut. This site is home to a variety of Kentucky specific water-resource information. It includes information regarding surface water, ground water, water quality, and many other topics. This site is home to a variety of Tennessee specific water-resource information. It includes information regarding surface water, ground water, water quality, and many other topics. The USGS operates the most extensive satellite network of stream-gaging stations in Tennessee, many of which support flood-warning systems. USGS' Tennessee Water Science Center has published a number of water-information reports on water quality. From this Web page, you can locate, view, download, or order scientific and technical articles and reports as well as general interest publications such as booklets, fact sheets, pamphlets, and posters resulting from the research performed by USGS scientists and partners. This USGS tool sends e-mail or text (SMS) messages when certain parameters, as measured by a USGS real-time data-collection station, exceed user-definable thresholds. Cartoon posters for grades K-12 on the subjects of wetlands, water use, wastewater, navigation, groundwater, coastal hazards, watersheds, water quality, and hazardous waste. A tool for sending an email or text message containing a USGS gaging site number and quickly receiving a reply with its most recent observation. The U.S. Geological Survey's National Water-Use Information program is responsible for compiling and disseminating the nation's water-use data. The USGS works in cooperation with local, State, and Federal environmental agencies to collect water-use information. USGS compiles these data to produce water-use information aggregated at the county, state, and national levels. The USGS software and related documentation on these Web pages can be used, copied, modified, and distributed without any fee or cost. Includes software applicable to water quality and chemistry, groundwater, surface water, and more. This dataset, termed "GAGES II", an acronym for Geospatial Attributes of Gages for Evaluating Streamflow, version II, provides geospatial data and classifications for 9,322 stream gages maintained by the U.S. Geological Survey (USGS). This dataset has two purposes: (1) to provide users with a comprehensive set of geospatial characteristics for a large number of gaged watersheds, particularly for gages with long flow record, and (2) to provide a determination of which of those watersheds represent hydrologic conditions which are least disturbed by human influences ("reference gages"), compared to other watersheds within ecoregions. The webpage contains the individual Environmental Contaminants Encyclopedia files in PDF format. You may also search the encyclopedia for individual contaminants or download all the entries. The HIS database provides summary statistics of surface hydrography (acres of lakes, miles of streams, etc.) within and adjacent to each national park unit using the U.S. Geological Survey's (USGS) high resolution National Hydrography Dataset (NHD), the NPS Administrative Park Boundary Dataset, and other sources. The Abandoned Mine Land Reclamation Program is OSMRE’s largest program. Since 1977, the AML program has collected over $10.5 billion in fees from present-day coal production and distributed more than $8.0 billion in grants to states and tribes, mandatory distributions to the United Mine Workers of America (UMWA) retiree health and pension plans and to OSMRE’s operation of the national program to reclaim land and waters damaged by coal mining. AMDTreat is a computer application for estimating abatement costs for acid mine drainage. The Applicant Violator System is an automated information system owned and operated by OSMRE. Information on applicants, permittees, operators, application and permit records, as well as unabated or uncorrected environmental violations of SMCRA are maintained in this nationwide database for OSMRE’s Federal and State programs. Under the Surface Mining Law, citizens may request an inspection of a mine if a violation is suspected. If your request provides a reasonable basis to believe that a violation exists, you also have the right to accompany the mine inspector when he completes the inspection. The procedure for requesting an inspection should begin with filing a request with the state agency, or with the Office of Surface Mining in the states of Tennessee and Washington, or on Indian lands. This 1998 handbook was developed by the Acid Drainage Technology Initiative. Information and resources related lead related laws and safety. Information and resources related mercury and mercury exposure. Members of the Agriculture Water Quality Authority are appointed by the governor to represent the state’s agriculture and environmental community while developing and supporting a statewide agricultural water quality plan. The statewide agriculture water quality plan is an effort to produce a practical, flexible, coordinated natural resources management system that protects the waters of the Commonwealth and complies with applicable government rules and regulations. This website lists members of the authority, contains links to meeting minutes, and links visitors to the Agriculture Water Quality Plan. This guide was designed as a field reference for timber harvesting operations. It contains minimum requirements and specifications of Best Management Practices appropriate for timber harvesting operations in Kentucky. Use of these BMPs will help reduce or eliminate sources of water pollution. An online survey was conducted in 2009 to determine the forest issues that are most relevant to Kentucky citizens. The Kentucky Forest Conservation Act requires loggers to use appropriate best management practices to protect water quality. The Division of Forestry has a number of resources related to the document including a Forest Conservation Act Fact Sheet, Loggers Guide to the Forest Conservation Act, and a What Landowners Should Know about the Forest Conservation Act document. The Kentucky Master Logger Program is an education program that teaches logging methods that benefit both industry and the forest. The program was developed following the passage of the Kentucky Forest Conservation Act, which regulates all commercial loggers and requires the use of best management practices to help protect water quality. Please visit the Kentucky Master Logger Web site for a complete list of upcoming classes. The Kentucky Statewide Assessment of Forest Resources and Strategy document identifies key forest-related issues and priorities to support development of a long-term resource strategy specific to Kentucky's forest needs. Specific sections of interest cover Water Quality and Quantity, as well as Funding. The Division of Mine Permits is responsible for assessing the impact of an applicant’s proposed operation on the environment. A Cumulative Hydrologic Impact Assessment (CHIA) is conducted for each application. The data is organized by the watershed’s Hydrologic Unit Code (HUC), which is used to identify the unique watershed. The data may include surface water quality, benthic information, groundwater quality, water quality violations, pollutant discharge elimination information, mine history and information regarding pending mines. The files are organized by their HUC 12 watershed and are available for download. The Kentucky Department for Natural Resources has posted water quality data taken from in-stream sampling sites throughout the Kentucky coalfields. The data represents analyses of water samples taken quarterly from July 2010 through June 2012. Samples were taken from 53 sites in the eastern coalfield and 11 sites in the western coalfield during the time period. A table on this webpage lists information for each sample site and a link to its data sheet containing the measurements of concentration for tested analytes. A 2009 field guide for erosion prevention and sediment control on construction sites created by the University of Kentucky, the Kentucky Department for Environmental Protection, and the Kentucky Division of Water. Every two years Kentucky reports to Congress on the condition of water resources in Kentucky. Water quality reports are available on KDOW's website in part or whole from the most recent back to 1996. 305(b) GIS data from 1998-2014 can be found here. The Kentucky Geoportal is an award-winning data clearinghouse that provides easy and convenient ways to access and share geospatial data resources, including a great many water related geospatial datasets and data resources. Division of water / water related datasets you can search for and find include KY Wild Rivers, TMDLs, floodplain permits, regulated dams, 305b water quality data, designated use waters, wellhead protection areas, combined sewer overflows, Municipal Separate Stormwater System (MS4) communities, groundwater monitoring wells, groundwater springs, state bioregions, Source Water Assessment and Protection Program data, permitted water withdrawals, priority watersheds, river mile points. The Kentucky Division of Water is developing a draft Nutrient Reduction Strategy to outline ongoing and future efforts to reduce the amount nutrients entering Kentucky waters and, ultimately, the Gulf of Mexico. Kentucky’s strategy is being designed as a comprehensive, overarching framework to guide reduction of nutrient loading and develop a reasonable and appropriate watershed-specific plan to manage nutrients. The strategy will build on programs already in place in Kentucky and will consolidate activities being conducted by other state and federal agencies.This webpage includes additional documents and information about the strategy. The KY Division of Water designed the Kentucky Nonpoint Source (NPS) Management Plan in 2014 to be used for several purposes. First, this plan was designed as a way to inform citizens of the work the agency is doing to reduce nonpoint source pollution. Second, anyone applying for a Section 319(h) grant should draw on this document as a way of understanding the Commonwealth’s priorities for the NPS Program. Finally, this document was intended to meet the Clean Water Act requirements and the US EPA’s Nine Key Elements guidance. The Water Watch program is dedicated to helping you protect Kentucky's streams, rivers, lakes and wetlands. The program accomplishes its goals through community education initiatives, community leadership, community action and water quality monitoring projects. KY Water Watch volunteers throughout Kentucky collect water quality data on the state's rivers and streams. A list of Water Watch groups can be organized by county, city, water body, affiliation or contact. The Kentucky Watershed Viewer is an interactive map capable of displaying a large variety of water related spatial data. Data layers include: KY Pollution Discharge Elimination System permit holders, permitted water withdrawals, river mile points, karst dye trace sites and flows, KY Division of Water priority watersheds, Wildlife Management Areas, wellhead protection areas, watersheds, designated use waters, exceptional and reference reach waters, 305b data (water quality), and municipal separate storm sewer systems (MS4s). Funding through Section 319(h) of the Clean Water Act is provided to the Kentucky Nonpoint Source Pollution Control Program from the U.S. Environmental Protection Agency. Funds can be used to pay for 60 percent of the total cost for each project; a 40 percent nonfederal match is required. Grants are available for watershed-based plan development and implementation, protection of Special Use Waters with identified threats, as well as other nonpoint source pollution control projects to help mitigate or prevent runoff pollution. Priority consideration will be given to applications for watershed plan development and implementation in 303(d) listed streams and protection of threatened Special Use Waters. 2013 study by the Division of Water. Since 1996, Kentucky communities have received grant funding from the EPA for wastewater and drinking water infrastructure projects. EPA refers to these projects as Special Appropriations Projects. This TMDL webpage houses pre- and post-monitoring reports that provide information about the TMDL process and relay scientific information about water quality and biological health. Quick links are available to approved TMDLs, delisted streams, TMDLs under development, and a TMDL tool kit. TMDL information can also be viewed specifically in the upper Cumberland or lower Cumberland regions. The WRIS is comprised of strategic plans, water resource maps and publications, systems management information, reporting and regulatory requirements, guidance and training documents, procedural guidance and forms for project implementation and funding, and internet links to support services. Interactive maps in the system support planning and regionalization efforts. The interactive maps also facilitate drought monitoring and response, and rapid response to contamination emergencies. The GIS contains data for water and wastewater treatment facilities, water lines, water sources, storage facilities, sewer lines, and a database of non-spatial systems information. The GIS provides the fundamental data needed for the planning and emergency response activities. Using the GIS infrastructure data in computer models allows for cost-effective analysis of engineering alternatives, and facilitates the efficiencies needed to meet the needs of Kentucky's infrastructure development. The Kentucky Groundwater Data Repository houses a variety of groundwater related data including: a searchable database of water well and spring records; a water well and spring location map; a searchable database of groundwater-quality data; graphical groundwater-quality comparison; a groundwater-quality data map service; and a karst potential index map service. The repository database currently contains information for over 92,000 water wells, 5,100 springs, and 50,000 suites of water-quality analyses (millions of individual analyte results). An interactive map that allows you to view and query groundwater quality data. Maps showing existence of groundwater pollutants across KY for manganese, iron, cadmium, mercury, selenium, pH, nitrate-nitrogen, and a number of other contaminants. This webpage also includes summaries of groundwater quality for the portions of the Cumberland River Basin that are found within Kentucky. This website has information about the Kentucky Interagency Groundwater Monitoring Network, a long-term, interagency groundwater monitoring network to characterize the quality, quantity, and distribution of groundwater in Kentucky. The webpage includes a map of sampling sites and annual reports dating back to 1999. Webpages with general information about karst, where it's located, groundwater in karst aquifers, flooding, vulnerability to pollution and more. Additional more technical resources are available such as KGS research on karst, a glossary of karst terms, and more. The State Soil Conservation Committee provides oversight and assistance to soil conservation districts in carrying out programs directed towards soil erosion control and water quality improvement on farmland. Links to soil conservation district contacts across the state are provided on this webpage. Any individual who discharges filter backwash and sedimentation basin washwater from water treatment plants to the waters of Tennessee must obtain an NPDES permit for such discharge. Any individual who discharges hydrostatic test water to the waters of Tennessee must file for coverage under the Division of Water Resources General NPDES Permit for Discharges of Hydrostatic Test Water. Point source discharges of biological pesticides, and chemical pesticides that leave a residue into waters of the state were determined to be pollutants under the Clean Water Act. The Permanent Stormwater Management Training website is available to design engineers and architects as well as plan reviewers and other local municipal program personnel. These courses and resources provide insights on avoidance and minimization approaches to site layout, design guidance on specific permanent stormwater control measures, and experience using tools developed to assist designers and plan reviewers with implementation of runoff reduction and pollutant removal requirements. This manual describes the current requirements of the TDEC General NPDES Permit for Discharges of Storm Water Associated with Construction Activities (Construction General Permit or CGP). Its focus is on field administration of TDOT construction projects to ensure that all phases of the work will comply with the requirements of the CGP. The manual discusses various materials and implementation methods for erosion prevention and sediment control (EPSC). This report provides evaluation and recommendations on changes to the Environmental Division Procedures and Roadway Design, and sediment and erosion control practices for construction projects. The SSWMP outlines the steps TDOT will take to implement erosion prevention and sediment control materials and practices for TDOT construction projects. Information about the plan and key documents are housed on this website. This 2003 BMP handbook was prepared as a reference guide for those who work in the forest, own forestland or are concerned about forest management practices and their effect on the environment. It is designed to assist foresters, loggers and land managers with each aspect of BMP installation. Topics covered include forest road design, construction and maintenance; special considerations for streamside management zones; timber harvesting and site preparation; and wetlands. It was a goal for this forest action plan not only to address national private forest conservation priorities, but also to be a useful tool to a wide range of organizations and individuals in Tennessee to address forest resource issues pertinent to this state. Where possible it compliments other state agency plans, such as the Tennessee Wildlife Resources Agency's State Wildlife Action Plan and Tennessee Department of Environment and Conservation's Recreation Plan, with a particular focus tied to maintaining water quality and quantity. Links from this page take users to information regarding forest resource conditions, benefits from forest resources, sustainability, issues and strategies, and priority watersheds. The Tennessee Forest Legacy Program currently conserves 35,000 acres across Tennessee, and is growing. Its mission is to protect environmentally important, working private forestlands threatened with conversion to non-forest uses. The Forest Legacy Program identifies and permanently protects environmentally important private forestlands that are threatened by conversion to non-forest uses. Delivered through Forest Service Cooperative Forestry, Tennessee and most other US states qualify as a participant and compete nationally for 75% grant funding each year. Click here for a map of eligible Forest Legacy Area Watersheds (2014). The Division of Forestry has professional foresters stationed across the state who provide technical assistance. They have been specifically trained to collect information on resources and work with landowners to develop forest management plans. The primary program for providing technical assistance is the Forest Stewardship Program. TDF foresters conduct on the ground assessments to determine the condition of timber resources, forest health, cultural resources, wildlife habitat and water quality. Foresters then prepare a comprehensive forest management plan based on landowner objectives. Foresters also follow up with landowners to encourage the implementation of the plan. Group workshops and presentations, the division’s web site, and County Forestry Associations (CFA’s) are other forms of technical assistance coordinated through TDF. The Division of Forestry investigates complaints about water pollution caused by timber harvesting. Complaints can be registered at any Division office or at the Tennessee Department of Environment and Conservation, Environmental Field Office, 1-888-891-TDEC (8332). Complaints can also be registered electronically using the TDEC Water Quality Complaint Form for Logging Activities. This webpage provides an overview of water quality programs and measures employed by the Division of Forestry. The 303(d) list is a compilation of the lakes, rivers, and streams in Tennessee that fail to meet one or more water quality standards. In addition, the list provides pollutant information and TMDL prioritization. 303(d) lists available on this site data back to 1992. The 305(b) Report summarizes the general water quality of surface waters in Tennessee. The report contains information about water quality, the assessment process, use support, causes and sources of pollution, and waterbodies posted due to human health risks. 305(b) reports available on this site date back to 2002. Citizens may submit complaints about water quality violations to the State of Tennessee by email, through the mail or by toll-free phone number. This website provides information for doing so. Drinking water analysis laboratories across the state of Tennessee. This report contains guidance for interpretation of existing narrative nutrient criteria based on regional reference data. The report summarizes reference nutrient data and describes how nitrate+nitrite and total phosphorus goals were developed. A searchable database of TN Department of Environment and Conservation enforcement actions. Dataset includes orders and cases, respondents, and affiliated documents. Data can be organized via a number of parameters such as case number, site name, violation type, city, county, signed date, and more. This 2016 document describes situations where water quality assessments may be based on information other than recently collected benthic or chemical data. This guidance is intended to assist well owners on precautions to take after a flood event submerges the top of the well casing. This 2015 manual provides steps and resources for protecting your well or spring. A searchable database of Division of Water Resources permits. Data can be organized via a number of parameters such as permit number, site name, permit type, city, county, and issuance date, amongst other options. A separate database specifically for groundwater permits (septic) is also available. Permits may also be viewed in an interactive Division of Water Permits Map. This document describes monitoring, analyses, quality control, and assessment procedures used by the Division of Water Resources to develop TMDLs, 305(b) and 303(d) assessments. The Division of Water Resources (DWR) has a comprehensive monitoring program that serves its water quality management needs and addresses all the state's surface waters including streams, rivers, lakes, reservoirs and wetlands. These report details the monitoring program plan, excluding inspection information: FY 2016-2017, FY 2015-2016, FY 2014-2015. Information about underground injection wells, drinking water, and public safety. An interactive map showing the water quality status of waters across the state of Tennessee. Data is derived from 305(b) and 303(d) water quality reports. Both causes and sources of pollution can be uncovered using this map. Additional map layers that can be viewed are water resource related permits, monitoring sites, and Exceptional Tennessee Waters. This webpage includes links to water quality laws, rules, general information and planning documents, water quality assessment documents (including 305b and 303d lists) and technical/engineering documents. The Wellhead Protection Program was established to protect public water systems using ground water from contamination. This program has an emphasis on the prevention of ground water contamination due to the difficulty in cleaning up the contamination once it occurs. This webpage has information about the program, protecting wellheads, sources of groundwater contamination, potentially harmful components of common household products, and more. This handbook is intended to help those who want to protect our waterways by establishing buffers across our state’s rapidly changing landscape including: Local governments (public works, parks, or stormwater departments); Non-governmental organizations (watershed groups); Community groups (civic groups); and Water-side property owners (homeowners, HOAs). The Water Center offers unique capabilities through its consulting lab. Water and wastewater lab consulting services include:Industrial wastewater treatment process analysis design; Drinking water and wastewater treatability studies; Wastewater characterization studies; Wastewater treatment unit process evaluation using nonstandard analytical techniques including particle size distribution analysis, solids oxygen demand determination, and long-term biochemical oxygen demand; Aerobic and anaerobic biological wastewater treatment process pilot studies; Coagulation process optimization using zeta potential measurements; Activated carbon absorption studies; Robotic reservoir/stream water quality analysis; and GIS capabilities for field study design. Didymo, native to parts of northern North America and Europe, is a type of algae found in cold, nutrient-poor rivers that produces thick mats across the bottom of streams. It has the potential to impact fish populations by smothering suitable habitat and other native organisms that they depend on. In the Cumberland River Basin, didymo has been found in the Obey River. This webpage has more information about the problem and what you can do to mitigate it. "When it Rains, It Drains : What Everyone Should Know About Stormwater" and more. This side provides a list of stormwater public involvement resources. Resources include: EPA Preliminary Data Summary of Urban Storm Water Best Management Practices Study; Georgia Adopt-A-Stream Resources; Give Water a Hand; Minnesota Association of Watershed Districts; You Did See a Fish ... (Door Hanger); What is Volunteer Monitoring? and more. This report provides the results of research conducted by the Tennessee Water Resources Research Center on statewide volunteer monitoring programs. Its intent is to inform Tennessee decision-makers and other stakeholders so they may begin an earnest dialogue on the viability of initiating such a program in Tennessee. This interactive story map show water quality conservation practices implemented on this concentrated animal feeding dairy operation along the Little River in East Tennessee. A how-to guide for using cuttings from dormant woody vegetation to revegetate bare stream banks. Water quality in many ponds is poor due to poor management. Sediments and excessive nutrients, especially phosphorus, cause algal growth, low dissolved oxygen levels, fish kills and odors. Herbicide technologies for controlling algae do not treat the problem but rather the symptoms, therefore control with herbicide is often temporary. Addition of alum, a common technology for drinking water treatment, treats the problem. Tennessee Smart Yards is a University of Tennessee-led program that guides and assists Tennessee residents and neighborhood associations on practices they can apply in their yards and common spaces to create healthier living spaces and communities. Courses aim to help homeowners achieve a landscape that reflects their values, desires and needs, while ensuring the protection of our state's waterways. Water related principles of a smart yard include using water efficiently, using fertilizers appropriately, reducing storm water runoff and its pollutants, and potecting water's edge, amongst others. Check out the Smart Yards yardstick for a check list of mitigation activities associate with smart yard principles. A webpage with a variety of environmental stewardship related teaching resources organized by soils, water and watersheds, wildlife and ecology, and more. Water and watershed related resources include teacher modules on Nutrient Pollution and Eutrophication, Stormwater Mapping, Sediments and Water Quality, Benthic Macroinvertibrates, Rain Gardens, Soil Water Holding Capacity, and Watershed Mapping. This calendar provides ideas on how you can improve your operation and practice stewardship. Fire hydrant flushing is a routine maintenance process where hydrants are turned on to allow water to flow for several hours. Flushing is necessary to remove sediment and iron compounds from water mains and to circulate the water to help prevent stagnant water problems from developing. Clarksville Gas and Water has identified improper disposal of fats, oils and grease (FOG) as a major cause of damaging and costly sewer overflows in our sewer collection system. Clarksville addresses the issue with our proven FOG program. This webpage provides more information and what you can do to help. The Pretreatment Program is designed to reduce the level of potentially toxic pollutants discharged by industry and other non-domestic wastewater sources into municipal sewer systems, and thereby, reduce the amount of pollutants released into the environment from these sources. Click here to view or print the Clarksville Pretreatment Program. Information about how to prevent sewer backups. This webpage provides a work schedule for sewer infrastructure improvements. Clarksville provides information to its citizens relating to Sanitary Sewer Overflows. Links to reports can be found on this webpage. The goal of the City of Franklin Water Management Department is to supply safe water to every customer under all foreseeable circumstances. Each instance where water is used improperly so as to create the possibility of backflow due to cross connections threatens the health and safety of customers and chances of realizing this goal. This webpage includes additional information about Cross Connections and includes the City's Cross Connection Control Plan and links to Tennessee Approved Backflow Prevention Assemblies and the Tennessee Backflow Prevention Association. Franklin aims to identify and eliminate illicit discharges to ensure protection of the environment, proper clean-up of materials, and increasing public awareness of ways to protect the environment by preventing harmful discharges and accidental spills. The program includes the starting of field screening, stream inspections, wet weather monitoring, and complaint response. This educational handoutprovides examples of illicit stormwater discharges. The 2016 Stormwater Management Manual has been compiled by the City of Franklin to assist planners, developers, contractors and various businesses and industries and the City of Franklin in stormwater pollution prevention and water quality protection. Specific sections of the manual include: 1) Policies & Procedures; 2) Construction Management Practices; 3) Temporary Construction Site Runoff Management Practices; 4) Permanent Erosion Prevention & Sediment Controls; 5) Permanent Stormwater Treatment Controls; 6) Industrial & Commercial Runoff Management Practices; and 7) Other Source Controls. In addition to the manual itself, this page includes an interactive map of active construction sites, a land-use based water quality calculation tool for developers, the state's urban riparian buffer handbook, information about post construction & maintenance measures, and more. This page is home to information about Franklin's Water Treatment Plant. It contains links to the City's Water Treatment Plan Upgrades, a map of the City's Water Utility District, annual drinking water quality reports dating back to 2010. A water quality report for the City of Hopkinsville's drinking water. Annual reports to the State Department of Environment and Conservation on Murfreesboro's stormwater program activities. A 2015 annual report on the City's drinking water quality is available here a 2016 report is available here. Resources for helping homeowners manage stormwater pollution. Resources include: the Homeowners Guide to Cleaner Water; how to Create a Streamside Buffer; 25 Ways to Prevent Water Waste; How to Make a Rain Garden; How to Make a Rain Barrel; How to Recycle Used Oil; Oil Recycling Locations; Summertime Tips for Water Quality; a Storm Drain Labeling Fact Sheet and Storm Drain Labeling Request Form; and Grass Clipping Disposal and Fertilizer Usage Information. This website is home to information about these issues and Murfreesboro's efforts to address them. The page links visitors to a Cross-Connection Control Procedures Manual and a list of cross-connection certified plumbers. Proposed land development or redevelopment in Murfreesboro submit site plans, subdivision plats, construction plans, and stormwater designs and calculations to the City’s Planning and Engineering Department. More information about these requirements, including plan reviews, permits, and the stormwater user fee, are available on this page. Links are also provided to post-construction stormwater quality standards and design manuals. FOG is Fats, Oils and Grease that is generated in restaurants and in your home as a by-product of handling and preparing food for consumption. This webpage covers basic information about the problems associated with fats, oils, and grease, the do's and don'ts of disposal and additional resources such as Grease Trap / Interceptor and Sampling Box Specifications; a Grease Control Equipment Sizing Spreadsheet; and 2016 Grease Control Equipment Service Providers, and answers FAQs. Interactive, water-related maps from the City of Murfreesboro include and Advanced Metering Infrastructure Map (locations that meters are currently being installed), a Water, Sewer, and Repurified Water Map, a Stormwater Map (flow direction for City Stormwater), and aStream Assessment Map (visual stream assessment points and other stream characteristics). Information for homeowners on responsibly disposing of grass clippings and applying fertilizers. A list of impaired and TMDL waters in the City of Murfreesboro from the City's 2014-2015 Stormwater Annual Report. Click here for amap of Murfreesboro showing watersheds, healthy and impaired streams, and the City's urban growth boundary. This webpage provides a variety of stormwater resources including Murfreesboro's stormwater quality standards and Stormwater Ordinance, the City's Stormwater Planning and Low Impact Design Guide and Stormwater Controls Manual, and additional technical memoranda and design examples. The Stormwater Department performs several different forms of monitoring and sampling in local streams and in the storm sewer system, as part of the city’s stormwater program required by federal and state regulations and permit. This website has additional information about this program and links visitors to the Bear Branch Watershed Plan with the US Army Corps of Engineers and visual stream assessments for East Fork Stones River Watershed, Lytle Creek Watershed, Middle Fork Stones River, Overall Creek Watershed, Sinking Creek Stream, and Upper West Fork Stones. The site also houses several stream assessment videos shot at Bear Branch Creek, where the City was found trash and sediment and checked the streams pH, conductivity and temperature. Regulations from the Stormwater Management Manual. The regulations section of the stormwater management manual coversPolicy and Permitting Procedures, Floodplain Requirements, Technical Guidelines and Criteria, Post-Construction Water Quality Policies & Procedures, and more. New development and significant redevelopment sites are required to preserve water quality buffers along Metro’s community waters, which include streams, rivers, springs, lakes, ponds, and wetlands. Additional information about buffers and buffer requirements is available on this webpage. Annual drinking water reports for Nashville dating back to 2010. AMA keeps a close eye on water quality monitoring data from mine sites. An interactive map of abandoned mines across the Appalachian region. Through the Appalachian Water Watch program, we work to address water quality issues in coal-impacted communities around Central Appalachia by promoting and ensuring compliance with laws that protect clean water. The Appalachian Water Watch Alerts Site was created to help people in Central Appalachia report and track incidents of water pollution.The Appalachian Citizens Enforcement Project is designed to fill the vacuum left by the lack of state enforcement through empowering communities to monitor their own water, creating a broad perspective into the extent of coal-related contamination across the entire region. The Accountability through the Courts has information about water quality laws and lawsuits in the region. An interactive map of coal ash ponds across the southeast. Appalachian Voices provides a variety of educational resources including MTR 101, Coal Ash Educational Materials, and Fracking. 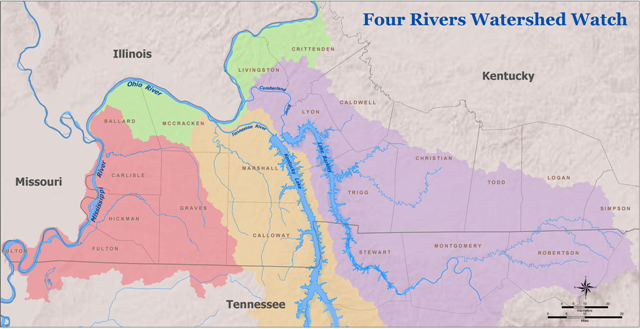 In depth profiles of the Cumberland River Basin, divided into four regions. Topics covered include history, natural features, waters value, our impacts on water, watershed management and more. In Nashville, it may come as a surprise that a complete picture of the location and number of dams does not even exist. Working with area volunteers, we are walking streams and inventorying dams. In so doing, we’re taking the first steps towards the eventual removal of those dams that are outdated and unnecessarily impacting water quality. With your help we can begin to reconnect our waterways! This website includes a Metro Nashville Dam Inventory Map and information highlighting the benefits of dam removal. These educational maps can help you determine the water quality of streams in your neighborhood. Download your watershed map to determine if it is safe to swim and fish in your stream and what you can do to protect local waterways. HRWA recent sampling at the main seeps of groundwater into Liberty Creek found concentrations of the main hazardous chemical, toluene, at levels that have been found for the last 8 years. These are well above EPA risk limits to protect public health and the environment. More information about this issue and HRWA's efforts to address it are available on this website. In addition, the site links visitors to a 2013 report on the contamination. This webpage contains materials to help keep the community informed about the decisions being made that affect the Harpeth River's water quality. It includes recent press releases and an explanatory factsheets related to the watershed associations legal action's against the City of Franklin including: a Why Sue Franklin? factsheet; a Settlements with Smaller Sewer Plants factsheet; and a Lawsuit Summary factsheet. This page provides an overview of the settlement of the federal Clean Water Act citizen suit brought by HRWA against the City of Franklin in 2014. It provides an explanation of why HRWA filed the lawsuit, the terms of the settlement, what the settlement achieved, and what citizens can expect moving forward. This page includes links to related news coverage, the settlement itself, and more. This fact sheet contains information about water quality within the Harpeth River Watershed. It also contains instructions for using TDEC's interactive map portal, so that you can better use that tool to uncover the health of streams across the state. HRWA's Water Quality and Sustainability efforts focus on ensuring that policies and regulations are in place that support water quality. Efforts involve shaping growth and the built human landscape so that the ecological health of the river and its watershed is maintained and improved. HRWA's expertise include watershed management and planning, stormwater management and regulations, clean water law and regulations, federal and state permitting and local planning and zoning, and land use planning. This page includes links to HRWA's Protect Our River Campaign, Sewer work, Drinking Water efforts, Toilet to Tap, Egyptian Lacquer's point source pollution, Lowhead Dam Removal, and other science related efforts. This page also links visitors to a number of watershed plans including: the Five Mile Creek Watershed; the headwaters; the West Harpeth; Jones Creek and the South Harpeth. Four Rivers Watershed Watch is a group a volunteers that conduct stream quality surveys on streams, rivers, and lakes in the Four Rivers Region of Kentucky. Through the group’s efforts, citizens are provided with the training necessary to monitor stream quality. The data collected by volunteers is used to help develop plans to enhance the streams for fishing, swimming, wildlife habitat and drinking water supply. This page includes a map of the Four Rivers region, as well as a 2016 Training & Sampling Schedule and Four Rivers Watch Brochure. Information about nutrient pollution and why its a concern. This page links visitors to an EPA video about the issue. Educational materials about sediment and why it is a water quality concern. This webpage includes a link to an animated film about the matter. Basic information about the impacts of surface coal mining on water quality, as well as a conductivity related petitionfiled by Earth Justice (and partners including KWA) requesting that the EPA to establish a conductivity water quality standard for waterways in the Appalachian coal mining region. Although most blooms of green algae are not harmful, there are some that have the ability to produce toxins – called harmful algae blooms (HABs) or toxic algae. Remember, you can still boat, fish and recreate in Kentucky’s rivers, lakes, and streams. Just be aware that HABs exist. …and WHEN IN DOUBT, STAY OUT! The Richland Creek Watershed Alliance Water Quality Monitoring Program conducted a dissolved oxygen study in the summer of 2011 at McCabe Park in Nashville, TN. The study area was chosen to evaluate if water withdrawal used for irrigation by the golf course was causing poor oxygen conditions in Richland Creek. This webpage covers water quality issues Richland Creek is facing. Topics covered include the importance of riparian buffers, flood plains and floodplain development, development generally, nutrients, dams, and the current health status of Richland Creek waterways. An explanation of RCWA program work including education and outreach, water quality protection, and Stream Habitat Restoration and Wildlife Protection work. Richland Creek related videos, including a video of RCWA's annual Richland Creek clean up and news coverage of anoil tanker spill into Richland Creek. In this short report, River Network presents an overview of the extent to which volunteer monitoring efforts are incorporating partnering into their strategies, and how those partnerships work. A field guide for evaluating proposed watershed restoration plans. SELC seeks to protect the South’s cleanest waters, to rescue the most polluted ones, and to make sure there remains enough water flowing in our rivers and streams to support a healthy and diverse array of aquatic life. Priority Projects are listed on this webpage. In 2014, SELC and Harpeth River Watershed Association took legal action against three sewage treatment plants along the Harpeth River for ongoing permit violations and excessive sewage discharge in violation of the Clean Water Act. As a result, Harpeth Wastewater Cooperative and Cartwright Creek sewage treatment plants agreed to join a multi-stakeholder effort to restore the health of the Harpeth River. These utilities committed to expanding water quality monitoring in the river, developing a pollution management plan, and joining a diverse stakeholder group to work cooperatively on improving water quality. In 2016, SELC and HRWA successfully reached a settlement with the City of Franklin. In addition to new protections and monitoring for sewage discharges, part of the settlement agreement is a comprehensive study focusing on the entire Harpeth River watershed, the first such study in Tennessee. This landmark effort, in which SELC will be one of the participants, will assess the health and the risks to the Harpeth River and its tributaries to ensure the river meets water quality standards moving forward. SELC works to steer the Southeast away from its heavy reliance on highly polluting coal, participating in utility planning processes and working with state utility commissions to promote the retirements of outdated coal plants. Since 2010, we have helped secured plans or legally binding commitments to retire 30% of the Southeastern coal plant fleet. SOCM fights against social, economic, and environmental injustices. As a member-driven organization, the issues confronting communities in Tennessee have driven our work. We organize around several important issues in our state, including: Clean Water, Health and Environmental Effects of Extractive Processes (Mining, Fracking, etc), Bringing Green Collar Jobs to Tennessee, Solid Waste / Hazardous Waste, and more. This document contains information about the Stones River Watershed. It includes a map, as well as information about water quality and the importance of native vegetation. This PDF contains basic information for homeowners including recommendations for water responsible yard care, information about where to recycle oil, oil filters, antifreeze, and hazardous household waste, and more. This 2015 guide provides citizens with steps for putting sound science to work in their watershed. Interested person or organizations can contact TEC at tec@tectn.org if they would like to schedule a training workshop that covers these materials. Contents include the action guide for watershed assessment and restoration itself as well as the following appendices: Appendix 1 – Watershed Science and Mapping; Appendix 2 – Stream Assessment Final; Appendix 3 – Guide to Restoration Activities Final; Appendix 3.1 Tennessee Cedar Revetments; Appendix 3.2 – Guidance for Riparian Buffer plantings TDOF 2014; Appendix 3.3 Combined Rain Garden Workshop Guide; Appendix 4 – Guidance for Educators; Appendix 5 – Permits and Reporting Environmental Violations (TDEC); Appendix 6 – Watershed Restoration Plan Guidance; Appendix 7 CWA overview; Appendix 8 – Glossary Final. River adopters are involved in simple observation of watershed activities, monitoring of invertebrates (instream sentinels of possible pollution), trash cleanups, and streambank stabilization projects. Adopters enjoy their streams when they're clean, and they work with various entities such as TDEC's Division of Water Pollution Control to improve them when needs arise. This page includes more information, as well as Adopt-a-River Q&A and a link for adopting a river near you.